In 2007, several local photographers captured events and documented the Atlantic Yards footprint, which sits on the brink of radical change. We've asked photographers Jonathan Barkey, Tracy Collins, Amy Greer, Nathaniel Kensinger and Adrian Kinloch to submit their own highlights of this year in pictures. 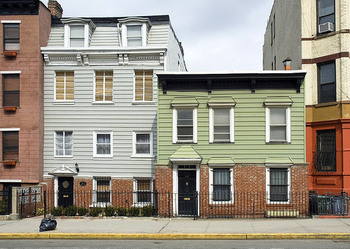 As a resident of Prospect Heights, Tracy Collins has shared the changes he has witnessed in and around the footprint of Atlantic Yards, and published Atlantic Yards: [De]Construciton of the Neighobrhood. 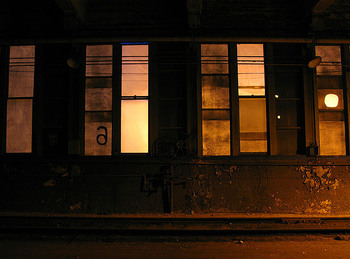 Collins's photo of 493 & 495 Dean Street appears in his book, and is a startling reminder that a house needn't be blighted in order to be declared "blighted." Graffiti by "Booker" (aka "Read More Books") on 810-812 Pacific Street has become a recognizable landmark, especially recently, after the buildings on either side have been demolished. This building is also under the threat of eminent domain. In February, just two months after the NYS Public Authorities Control Board granted official approval for Bruce Ratner's controversial Atlantic Yards project, work in the Vanderbilt Railyards was begun. 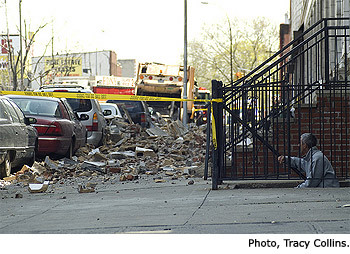 Brit in Brooklyn photoblogger Adrian Kinloch was on the scene to document the first appearance of workmen on the site. In February, upon hearing that Bruce Ratner would soon begin pre-demolition work on the Ward Bakery building, neighborhood activists demonstrated in hope of saving the historic structure, a former bakery distinguished by its white terra-cotta facade. 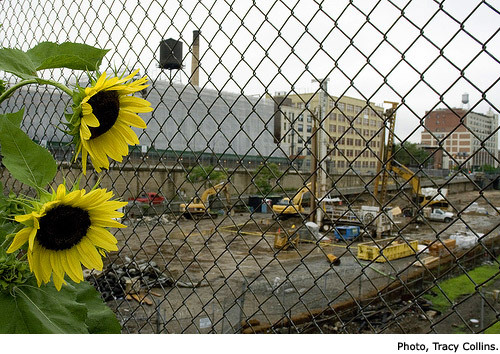 Photographer Jonathan Barkey presented his dramatic photo-renderings of Atlantic Yards at the August, 2006 public hearing. Since then, he has been documenting many of the community's press conferences and public forums. 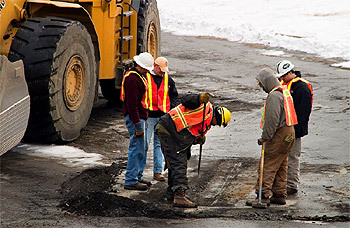 In April, 26 community groups and civic organizations filed suit against the Empire State Development Corporation, Public Authorities Control Board, Metropolitan Transportation Authority and Forest City Ratner, contesting the Atlantic Yards Environmental Impact Statement. 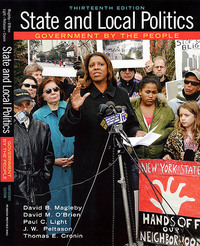 Barkey's photo from the press conference announcing the suit was featured on the cover of a textbook, "State and Local Politics: Government By the People." NoLandGrabber Amy Greer has been documenting the fight against Atlantic Yards since the early days. 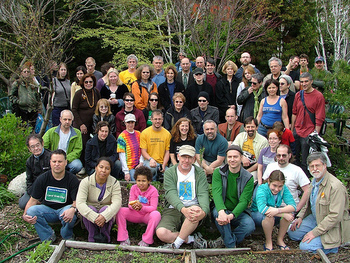 This past April, Greer took this "class picture" of representatives of several local neighborhood, community and environmental organizations, who filed a suit against the Empire State Development Corporation contesting the Atlantic Yards environmental review. In April, photographer Nathaniel Kensinger posted a series of photos on his blog from his trips into the Vanderbilt Railyards before developer Bruce Ratner started work in preparation of moving the tracks. 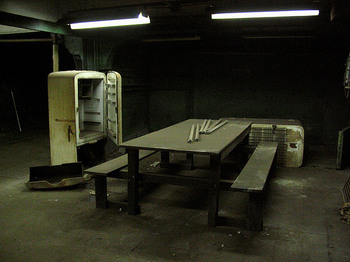 These are photos from inside "The Electric Car Shop" underneath Atlantic Avenue. 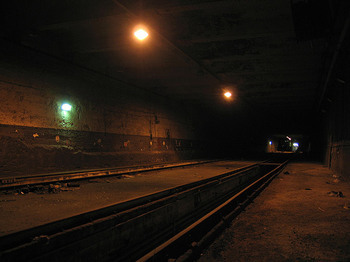 The Electric Car Shop and the LIRR tunnels next to it are among the most mysterious places I have seen in New York City. There was no graffiti anywhere, when usually graffiti artists are the first ones to find their way into underground spots. The tunnels and the car shop seemed to have been deserted but there were lights on everywhere and equipment left running. It took several years of walking around the area to find the right time to enter into these spaces. Now its looks like the entrance  on the east side of the Vanderbilt Yards  has been rendered inaccessible. 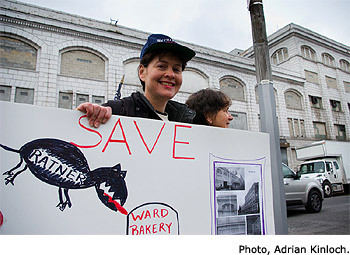 Despite protests, concerted opposition by community groups and civic organizations, and a petition drive, Bruce Ratner proceded with pre-demolition of the Ward Bakery building. While workers were on the roof, a 200-foot section of the historic building's parapet crashed to the ground. Amazingly, no one was injured. 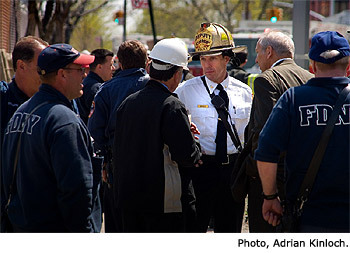 Photographers Tracy Collins and Adrian Kinloch were on the scene that day after emergency crews arrived and residents of the adjacent homeless shelter were evacuated. 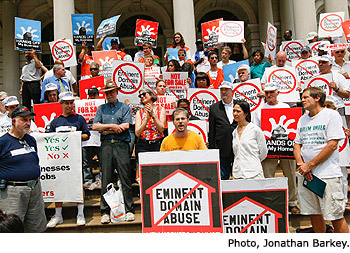 Jonathan Barkey made it to the June press conference and rally at City Hall held by groups fighting eminent domain battles in Manhattan, Brooklyn and Queens, who joined together to illustrate that eminent domain is a key aspect of the Mayor's urban renewal policy. 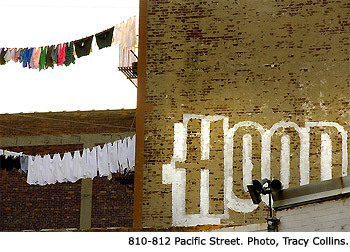 Tracy Collins's work reflects his deep devotion to Prospect Heights. Aside from his book, he also started the Atlantic Yards Photo Pool on flickr, which is a repository of photos posted by flickr users documenting scenes in the Atlantic Yards footprint and its environs. In August, Collins took the time to appreciate the persistence of nature, while work continued on the Vanderbilt Railyards. 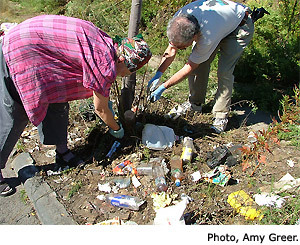 In late September, local community activists, fed up with the unsanitary conditions of the City- and MTA-owned sections of the Atlantic Yards footprint, held a neighborhood clean up. The billowing weeds hid a layer of street litter and household garbage. 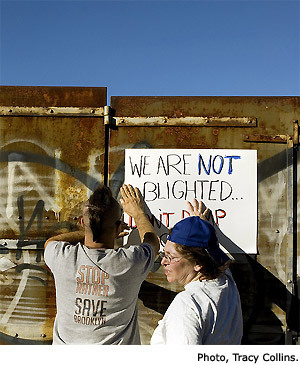 Amy Greer and Tracy Collins rolled up their sleeves and took photos documenting the event. 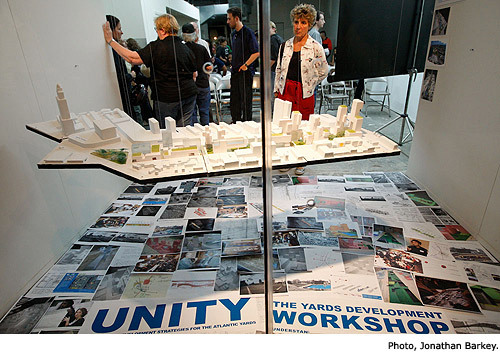 Jonathan Barkey attended the September presentation of UNITY2007, an updated community-based development plan for the Vanderbilt Railyards, at the Soapbox Gallery on Dean Street. 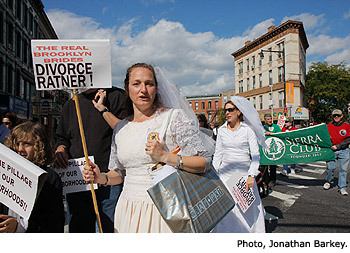 Develop Don't Destroy Brooklyn's third annual walkathon took place in October. 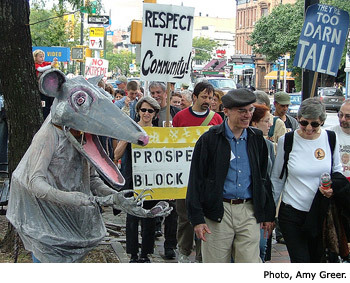 Participants included a band of Miss Brooklyn Bridezillas and a very annoying rat. 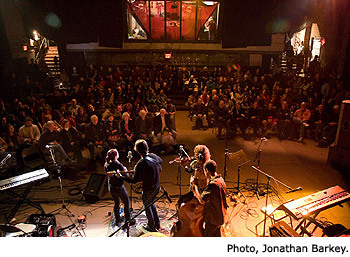 The Grammy-winning Klezmatics held their second fundraising concert for Develop Don't Destroy Brooklyn in November, at the Brooklyn Lyceum where Jonathan Barkey snapped this cool pic. 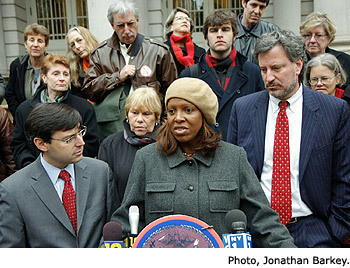 Toward the end of 2007, security concerns about siting the arena close to Atlantic and Flatbush Avenues was enough to make even politicians who support Bruce Ratner's controversial project squeamish enough to stand with their colleagues who oppose the plan, and local community groups, to demand an independent security analysis. Once again, Barkey made it to the press conference to capture the event.